We offer original concepts with customizable options designed for commercial spaces. Our work-surfaces are made with domestic regional hardwoods, reclaimed woods, urban timber and laminates. We strive to offer the highest quality product designed with the understanding that everything ages and everything needs to be flexible at some point in life. We are now offering a sit/stand desk through our Aymae Brand. 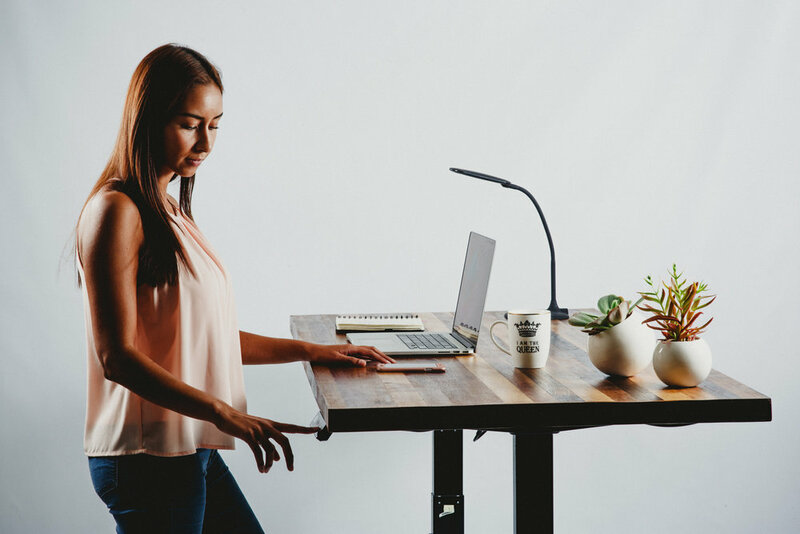 These motorized desks start at 30" and elevate to 50" at full height. Simple, clean design and technology make these pieces an exciting addition to our product line. We are creating a collection of accessories and customizable options for these desks to include keyboard trays, monitor holders, av/data grommets, etc. Click here for more information on this exciting new addition. You can select any finish or species for the desk top from either the Pegleg Studio product line or Aymae. There are 3 parts to a conference table; the top, the base, the technology going into it. It is our approach to keep the base simple and focus on the top. Below you will find several options for the form of the base. Each base is designed with wire management and technology integration in mind. All are related via the Common Frame system. You can focus your efforts on the surface of the table itself. We currently offer the 4 styles offered above for tops. Decide on the style and now consider material. Walnut, Oak, Ash, Ambrosia Maple and Cherry are our standard materials for Geo, Faux, and Long Plank style tops. Plam and true Slabs we file under 'Custom' for the time being. For custom surfaces you may specify a PLAM or in some cases (such as rift oak) PLAM is a viable, cost effective alternate to solid wood. Slabs are always a process of custom selection and are priced accordingly. Contact Stephen, he can help. Tell us what you need the table to do. If you have engineers or integrators providing hardware we can coordinate cut-ins for that technology. We are familiar with Extron and Doug Mockett products and often integrate them into our tables. We include the purchase and installation of Doug Mockett items with our product, however; hardwiring and providing power and data feeds to the table is the responsibility of the owner. We have designed all of our bases to be able to serve as wire chases and work in conjunction with a universal apron we call the Common Frame system. 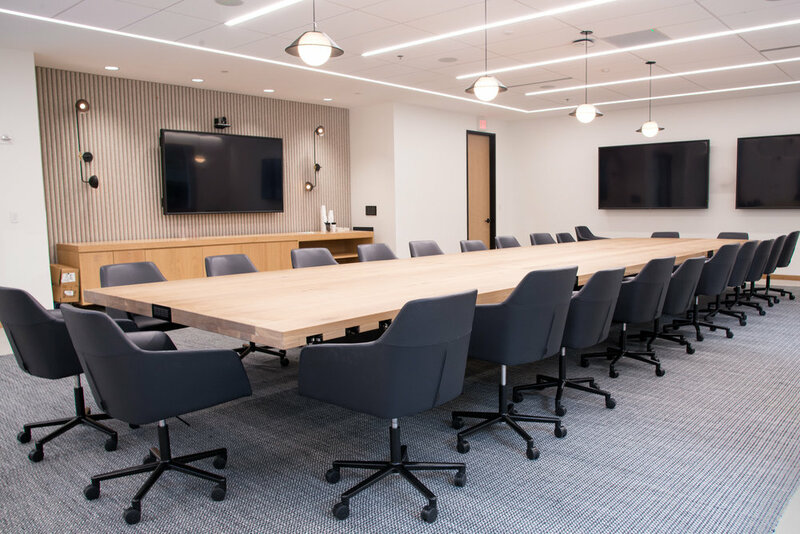 The Common Frame system is included with all conference tables we make. You can level the top separate from the bases, adjust the location of the bases to better capture the floor-core and manage wires with integrated chases and grommets. The rail system is made in steel yet remains lightweight and low in profile so you won't be hitting the arms of your chairs or your knees on it's bits and pieces. We want to make sure our table is made to suit your needs. Call 678-571-1645, or email Stephen. BIG DEAL Conference Table. We price configurations over 6'6"x15' with the Block House base in black (flat black or blackened steel) with your choice of top species and style. At these proportions the style of the base becomes secondary. In most cases it is reduced to functional stability in the least visible way possible. Shown below: 7' x 27' in Rubio Smoke white oak with Doug Mockett surface grommets custom mounted to the edge thickness. And they're probably the most popular thing we make. And they're always fun to build. You can choose from any of the forms below and your finish and material options run the gamut of everything we have to offer. Of course...sometime you need power just like the big table...that can happen here also. Click here and request more examples of these tables. If you have an existing concept or would like to collaborate for something unique for your space, we are ready to share our experience with your design. 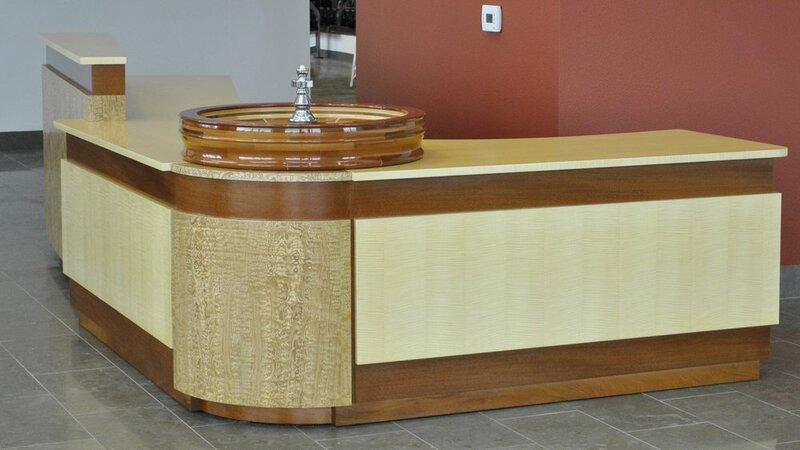 Reception Desks are always custom. 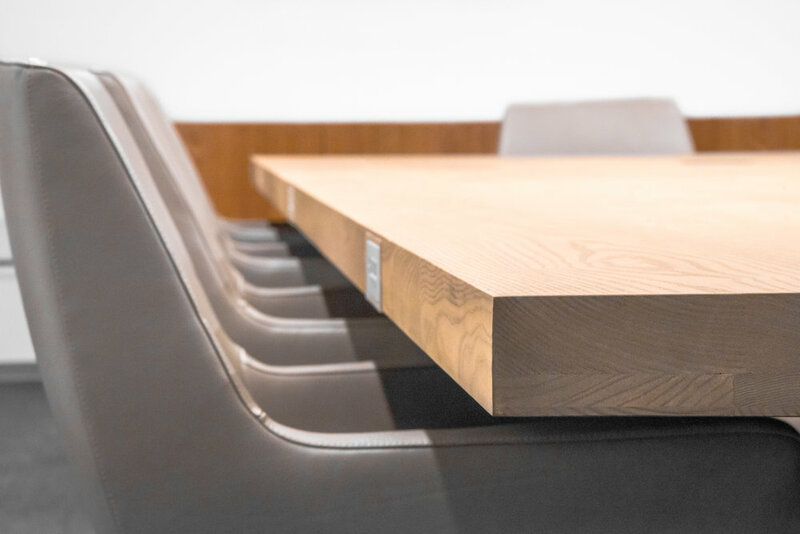 Scale, finish, durability, and function are all critical aspects of these pieces and it's no wonder they remind us of conference tables. We bring the same approach to wire management as we do with our original tables and desks. Access is important. Ease of use. Duration of service. Email stephen@peglegstudio.com and you'll receive a few simple questions to get the conversation going. USM, Las Vegas Nevada. ~7' x 15' overall. Atlanta, Ga. Designed by Focus Design. It’s okay to put your feet on these. 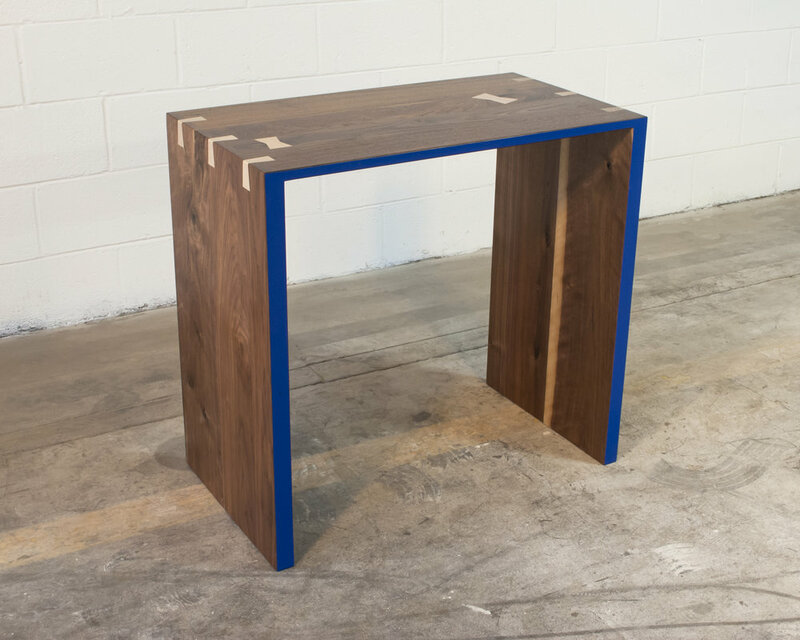 Our upcoming end table designs are limited editions! Since these are very material specific there's not a lot of flexibility in finish option...we've got to work with the material for the best results. Feel free to get in touch to learn more about these and whether they can be tweaked for you project.